A clean and fast backstroke start can be a challenge for even the most athletic swimmers! It take a lot of strength, flexibility, and practice to master. In this drill, Olympic Gold Medalist Tyler Clary demonstrates a fun exercise to work on getting your hips up and over the water by squeezing your glutes and then kicking your feet right at the very end to achieve a clean entry. This drill requires a partner or a coach and some kind of ball. There is some teamwork involved since the timing can be hard to get right, but once a swimmer masters this drill, they will have a faster and more streamlined backstroke start! Watch this short clip of Tyler Clary demonstrating this drill and notice how by having the proper technique, he is able to get a lot of power behind his kick at the end of his backstroke start. 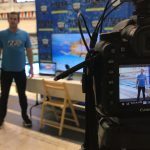 To see the full video including a longer description from Tyler and many more high quality technique videos from the best swimmers and teachers in the sport, subscribe at SwimVideos.net.